Christmas closely relates to expectation and future and new life. Pascale Bulloz's figures are a tribute to new life of form and character emerging from formless matter. Coated with gold patina they are a timely reminder of how noble and precious the "stuff of life" is. 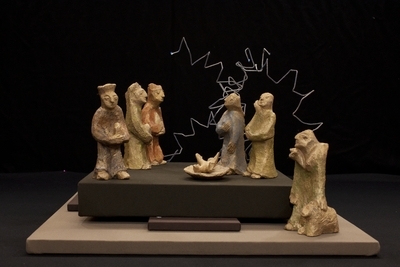 Clay figures painted and covered with a gold patina sculpted by Pascale Bulloz in 2008, depicting the nativity of Jesus. Exhibition label originally written by Fr. Johann G. Roten, S.M. for exhibit entitled "At The Manger" and held at Roesch Library, University of Dayton.